You can now analyze the sentiment of your text in 12 new languages. With this release, you will now be able to get a more complete view of your customer’s voice with an understanding of how your customers feel about your product or service, an international event, or news topic. Sentiment analysis is now supported in Danish, Dutch, English, Finnish, French, German, Greek, Italian, Norwegian, Polish, Portuguese, Russian, Spanish, Swedish, and Turkish. For details on the languages supported across all the capabilities, see the Text Analytics API documentation. Text Analytics is easy to get started with – try it yourself through the demo experience. Customers are already using the capabilities around the world, and it’s incredibly easy to do so. 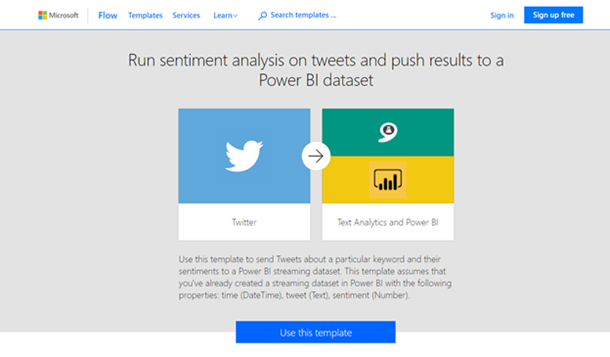 One such way is through Microsoft Flow, where you can start analyzing tweets and visualize the analytics in Power BI with a few clicks. See the Flow template to see this in action. The Text Analytics API is one of Microsoft’s Cognitive Services, which let you build apps with powerful algorithms using just a few lines of code. You can get started for free with a trial account today.